New broadband (SMA) isolators and circulators cover 2.000 to 6.000 GHz, encompassing S- and C-bands. Typical specs include VSWR of 1.45:1; isolation of 15 dB typical; and insertion loss of 0.7 dB typical. Package size is 1.58 x 1.62 x .7”. 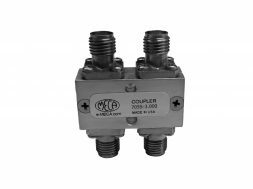 These augment existing isolators and circulators ranging from 700 MHz through 40 GHz.